In a growing economy like ours, more often than not, it is our markets that reflect if a particular government decision or policy carries positive or negative sentiments. Though it is overtly simplistic to attach federal decisions to market sentiments and scale something as good or bad for the country, I still believe, our markets, most of the times act as a good indicator. Be it the euphoria on the morning of May 16th when the markets opened more than 1000 points in green or the positive response in the market today post the first cabinet expansion of Modi government, it points somewhere in the direction of positive assessment if not 100% nationalistic. By the way money and nationalism as such don’t gel too well. Ask the black money hoarders if you feel it is the other way round. Hence I am not too interested and confident in mapping the nature of a particular Fed decision against the market sentiments. Before we move on, here comes a little clarification. My idea is not to give unnecessary ‘Gyan’ to my readers on stock markets. That responsibility is reserved for the incomprehensible mortals like Rakesh Jhunjhunwala. I am as far from stock speculations as Sharad Pawar is from Cricket and honesty. So let’s move on to a field where I consider myself of doing some kind of justice to my analysis though I am far from being a Vinod Mehta or Kumar Ketkar to be there in every TV channel once its hits 9PM in the evening. By the way, these two gentlemen are no less incomprehensible than Rakesh J in their field of political speculation though they fail miserably each time with their procrastination. 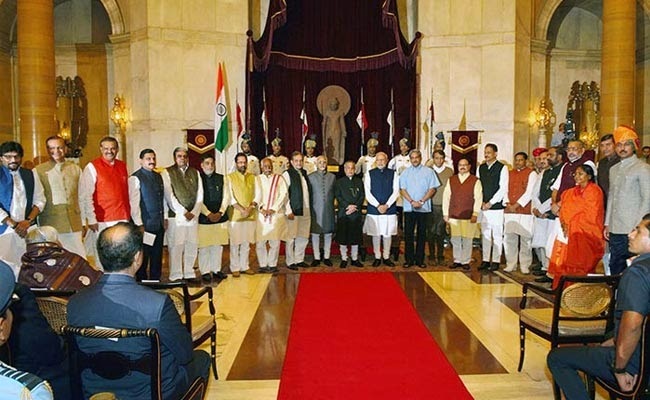 So, without wasting much time in running around; what is your assessment on the expansion of Modi cabinet? Sounds like a tough question forced to appear too small to even occupy half a line’s space? Then let me make it simpler for you. If you were to answer this question in three simple options of ‘Good’, ‘Bad’ and ‘Ugly’, where will you push that vote button? Still tough? Then how about analyzing it together? If you ask me, I am little apprehensive about this expansion and I have reasons for it. First, all of us will agree that our politicians are as useful to both this country and us as Abhisekh Bachhan is for Dhoom sequel. The primary thing that I liked most about Modi is his style of governance. He not only vouched for ‘Minimum Government, Maximum Governance’ but also made sure that the ideology is implemented on the ground level in Gujarat. And what this phrase suggests in terms of governance? It suggests that people would have more of governance than those who govern them. This would allow people to be more accessible to their legitimate expectations from a government without the unnecessary interference of our political class and the hordes of Babus in our government offices. By limiting the human interference which in our case is a double whammy knowing how 80% of our public servants are corrupt, Modi ensured that the benefits will reach the common people without much hindrance and fuss. I am not the only admirer of this Modi idea. In fact that was such a beautiful proposition of Modi that the seasoned Modi haters from the Congress camp couldn’t disagree. They didn’t disagree not because of sensibility but because, they were to believe their erstwhile leader Rajiv Gandhi and his impost; how only 10% of the benefits reach the last man on the street. In the light of this extraordinary explanation of mine, I felt Modi devaluated his own stand on ‘Minimum Government, Maximum Governance’ by inducting more ministers to complicate the already complicated Indian style of governance. When Modi started with a small cabinet, I was the first one who stuck my neck out and gave it 10 out of 10 for one sheer reason – lesser number of people to loot the funds/policies meant for the common citizens. Modi’s style of colluded ministries handling more than one portfolio unlike UPA-I/II was something which I found not only judicious but also as the call of the hour. But my authentication seems to have fallen flat on its face as I saw more than 20 people got inducted to team Modi and swelled the ministerial Babudom to 66 already. I am sure Modi as well as the nation could have easily done without this not so required burden. Now let’s move to the nature of this expansion as part of our second stage analysis. When I say nature, I am not going to discuss on the competence level of the inducted dignitaries. Knowing Modi, I am sure there could seldom be a place for incompetent hacks in his scheme of things. Let that discussion be reserved for Congress party power hierarchy only. Let’s ponder a bit and see how the selected ministers represent our vast demography. 3 ministers from Bihar with equal number of representation from UP. There is a couple from J&K and Jharkhand with a sole representation of Babul Supriyo from Didi’s Land. I said Didi’s Land not Bengal because Didi for some time is behaving like a dictator, leaving nothing credible to keep calling Bengal as a democratically run state. Nevertheless, let’s move to the topic in hand. All four states mentioned above have one thing in common: Their assembly elections are coming up in a months’ time. UP is little far but knowing how important UP is for our national politics, it would always be in the radar of any politician who has national goals. So UP, irrespective of when it will have its election would be there on the priority list of every aspirational politician. Keeping aside my own out of the box conspiracy mongering, can I ask all of you one quick question: Does this look like an expansion with an eye on the poll? BJP spokespersons may vehemently deny but the fact on the table is clear for everyone to see. More important is the induction of Ram Kripal Yadav, the once right hand strong man of Lalu. This is a clear indication for those fence sitting strongmen of RJD and JD(U) to rethink on their future. It is a question for them to answer; if they wish to enjoy all that Ram Kripal Yadav is enjoying or keep on sitting on the fence or even worse to embrace Lalus and Nitishs of the world. Few may argue, but this is some kind of over doing by Modi in a state like Bihar where BJP is already on a strong footing. With or without new ministers in the cabinet BJP still would win the state comprehensibly. Though I agree to this systematic representation argument of BJP, I still see a plan. A controversial character like Giriraj Singh getting inducted talks about a bigger plan of Modi than just winning the state. First, Giriraj Singh represents probably the most backward and least privileged section of the state called the Bhumiars. By installing Giriraj Singh as the face of the Bhumiars, Modi seems to have played a master stroke in combating Lalu Yadav in the southern belt of the state. That said, it is just not about the southern part of Bihar where BJP is visibly weaker than other areas. Knowing Nitish Kumar and his new found secular avatar, it is hardly a matter of time before Congress jumps into the ring to support Nitish in the state, in the name of secularism. After all Congress has to stay relevant or else even their shadow will ditch them at some point. Lalu has already done the support drama quite shamelessly. It is a fact that both Lalu and Congress are sinking ships and they would go to any stretch of shamelessness to live another day. In the event of this mega congregation of wolves, Modi’s dream of a Congress free India would have some jolts. In other hand, like Delhi, Congress would want to remain close to power by any means. And this is precisely what Modi wants to strike out from the future equations. He not only wants to wipe out Congress but also JD(U). And for this BJP would need to penetrate into every area of the state. Babul Supriyo’s inclusion is more symbolic than strategic. I said symbolic because I don’t see BJP making serious dents to TMC’s fortunes in the next assembly elections at least. The best BJP can achieve or dream of achieving is the position of the main opposition party in the state. On this endeavor, inducting someone from Bengal plays a vital role. Thanks to Mamata Banarjee, for quite some time there isn’t anyone representing the state at the center. While Didi is full time busy ruining the state from where the Left has left it after their three decades of misrule, none there from the state is at the center to fight for the state’s cause. There is apathy in governance, both at the state level and at the central level as well. In such a scenario this induction in the cabinet could very well act as a ray of hope for the citizens of the state. More than a strategy Modi wanted to make a statement to the people that even the single winning candidate from the state is duly accommodated in the power circle in view of the state to which he represents. So people sending more BJP candidates from the state would eventually be a self-help act in elevating the state in more ways than one. For J&K it is both a statement as well as a strategy. In fact Modi spending Diwali with the people of J&K is the first part of this very strategy that I am talking about. NC is badly positioned in the upcoming elections and so as the Congress. In fact Congress is badly battered and I am sure none in the Congress camp will lose a single breath if the party fails to even open their account in the state. There is a big vacuum that has emerged post the electoral bashing of Congress. Quite literally the road for BJP to fill this vacuum is pretty much unobstructed. Unobstructed because BJP has got little to fear about PDP since, in the eventuality of a coalition government PDP would be like a natural allay. What Modi need to tackle are NC and the fading Congress in the state. In our 60 odd long years of democracy, for the first time BJP smells blood in J&K and Modi doesn’t want to let that opportunity go begging. To cajole the voters of the valley (read Kashmir), which is a weak spot for BJP, Modi as part of his strategy inducted two ministers from the state. In a way Modi wanted to tell the people of the valley that, now they have two ministers in Delhi who will regularly take stocks of the welfare of the state and keep on raising their voices for the state and its people. So the simple equation stands valid here: give us more representation for better arrogation of the state with icing on the cake being a BJP Govt in J&K. Frankly, I am not sure what Modi wanted to achieve by inducting one minister from the state of Jharkhand. In any whichever way, the state is almost in the kitty of BJP. What rather Modi should concentrate is to have a strong and development oriented man to head as the CM of Jharkhand. As far as I can see, not only BJP but almost all political parties in the state lack a credible leader. This is the primary reason why no party in the state was able to give a stable government in the state in last five years in as many attempts. Hope BJP has worked on the basics on how to plug this notorious and noticeable lacuna in the state of Jharkhand.